Two years of commitment from students and staff have yielded positive results from our homeroom initiative. Participation in extracurricular activities has increased, discipline referrals have decreased, and academic achievements are being celebrated with greater frequency. Despite these successes, some of our students and teachers are asking, "Couldn't we be making a greater impact with our homerooms?" The answer is yes, and this is where Schoology, our LMS program, comes to the rescue! Here are three features within Schoology that will help us make our homerooms sizzle. Updates - Our homeroom section is only eleven minutes long, which rarely leaves time to get all of the announcements and reminders sent out, let alone gather opinions from thirty or more students. 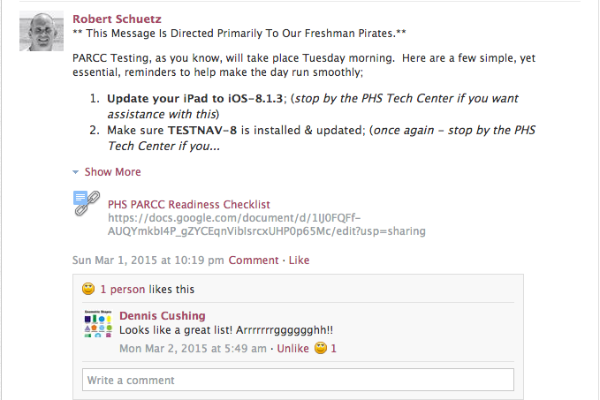 Schoology updates appear as notifications and communication strings on our students' iPads. Update messages can be enhanced by files, links, audio comments, and polls. Updates can be school-wide, or course / group specific. Parents who have joined the Schoology courses or groups receive the same updates as their child. Flipping the announcements and reminders permit teachers and students to have more meaningful interactions during homeroom time. With notifications being set to either SMS (text) or email messages, classroom communication gets shared in "real time". Discussions - Our students love to share their voices. With only eleven minutes of homeroom time, Schoology discussions allow the conversations to continue beyond limited face-to-face opportunities in homeroom. Discussions can be assigned individually, to the entire class, or shared to other classes. Discussions can be aligned to learning standards, they can be graded or ungraded, and best of all, discussions can be created to require a comment before seeing the comments of others. Many of our teachers are using discussion boards as ice-breakers to accelerate and enhance classroom conversations. Some students continue discussions, learning from each other, long after their courses have ended. Media Albums - Capture learning when it happens. Schoology media albums are safe repositories for media captured by learners within a course or group. Our students are using their iPads to upload pictures and videos from their photo rolls, or perform live captures right into their course media albums. Captions and comments can be added to pieces within a media album. Items can also be tagged for easy searching within the Schoology course. 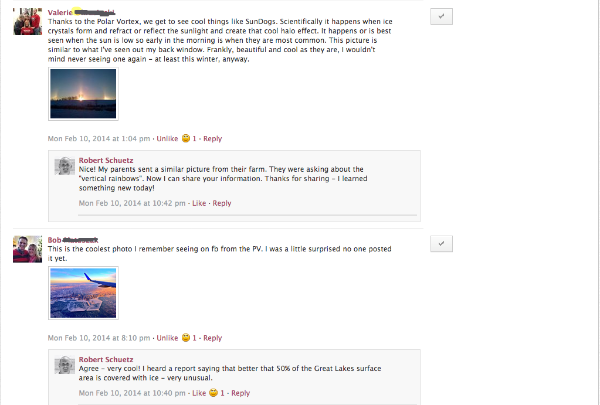 Once again, parents who follow Schoology courses are able to share in the learning experiences of their child. 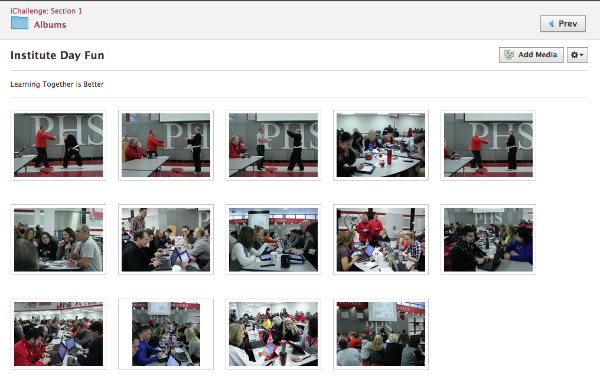 Sports and clubs use media albums to document and share contests and events. Homeroom teachers are able to create a digital scrapbook of student learning and accomplishments. Since our homeroom teachers stay connected to essentially the same group of high school students for four years, it's easy to see the powerful potential of visually recording and sharing their longitudinal growth. Our student advisory sections are transforming the culture of our school. Relationships formed in homeroom are helping teachers and students make progress towards school goals. There are other features within Schoology (advisee role, workload planning, and portfolios) that will certainly support our homeroom initiative, but updates, discussions, and media albums are popular, easy-to-use tools that can put more sizzle in the homeroom experience. These tools also provide a practice area for students to become responsible digital contributors. I hear you asking, "If these tools are powerful enough to enhance the homeroom experience, wouldn't they also create empowering opportunities for the students in our regular classes?" Hmmm, what do you think? I am in EDG646 with Instructor Lyn Hilt. We are looking through educational leaders blogs and I took time to look through yours. I love the idea of using schoology discussions with your students to allow them time to interact with each other prior to the start of the day or class. In our elementary school we use Morning Meeting and the impact these discussions have on creating a community and having everyone's voice be heard is crucial. This allows students to be acknowledged that they are there and ready to learn and contribute. It allows the teacher and other peers to recognize each other and not let individuals feel alone or not important. I love what you are doing with this. Thank you for reading and contributing to this learning experience.